As the name suggests, Ultraluminous X-ray Sources (ULXs) are objects that produce more X-rays than we would naively expect. To be “ultra” bright, their X-rays must shine brighter than a million Suns. If our own Sun shined this brightly, it would be tearing itself apart due to the massive amounts of radiation it would emit. ULXs are seriously bright. So what is a ULX? ULXs probably come a number of different objects, ranging from quasars to supernova remnants. The ULXs we’ll talk about today are variable on timescales as short as a few days. These volatile objects are most likely extreme X-ray binaries, or binary stars where one star is actually a compact object such as a neutron star or black hole. It’s actually really hard to figure out what the compact object might be! On the one hand, the compact object might be a neutron star with an extreme magnetic field whose pole faces us. This would cause the radiation from accretion to beam in our direction, making the object appear much brighter than it actually is. On the other hand, the compact object might actually be a black hole, in which case it would be need to be a rare “intermediate mass” black hole, with a mass hundreds to thousands of times larger than our own Sun, to explain the huge amount of energy coming from these objects. The authors of today’s paper try to tackle this mystery using astronomers’ favorite tool: high-resolution spectroscopy. Specifically, the authors take X-ray spectra, using the space telescopes XMM-Newton and Chandra, of two ULXs: one in the galaxy NGC 1313 (the cover art of this article) and the other in NGC 5408. Previous studies have used lower-resolution spectra and noticed that basic models couldn’t capture a lot of the apparent noise in the data. So it would make sense if this ‘noise’ was actually due to a plethora of unseen atomic lines littered across the spectra. 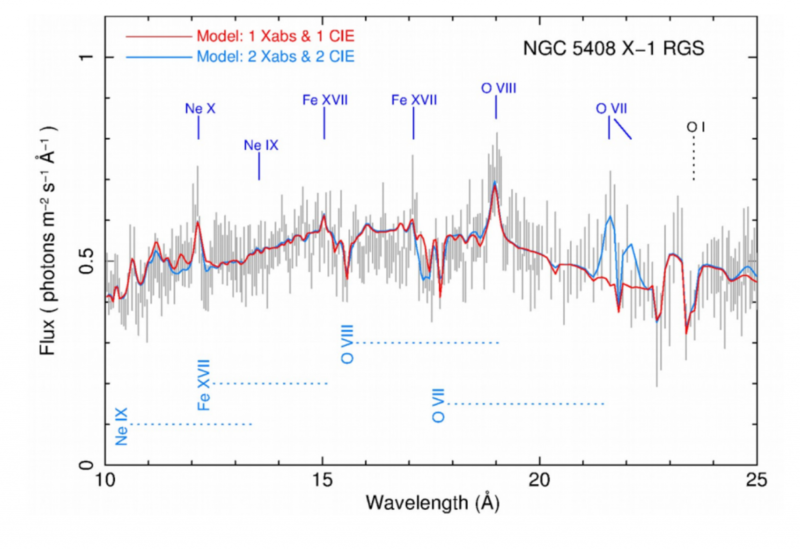 Fig 1: Part of the high resolution X-ray spectrum for the ULX in NGC 5408. The red/blue lines show different models for the data (black). Both absorption and emission features exist in the spectrum. And in fact there are! The authors find a forest of emission and absorption lines in the X-ray spectra (one of which is shown above), which means that the environments surrounding these similar ULXs are complex. They detect two notable features: First, adsorbed atomic lines which are blueshifted at 1/5th the speed of light. Recall that a blueshift means that the material is actually moving towards us, indicating that there is an extremely fast outflowing gas from the system! Second, they find atomic lines also in emission and neither redshifted nor blueshifted. So what does this mean? The authors claim that the blue-shifted absorption arises from an extremely fast outflow from the system as the material from the star accretes onto a black hole companion. This is commonly seen in other X-ray binaries with disks, but in this case the velocity is notably higher, implying higher energies. The emission lines are excited by a collisional battle between the accretion outflow and a wind from the donating star, leading to an even greater X-ray flux. Although this highly resolved look at this complex system offers a lot of insight into the physical picture, the authors can’t get a good constraint on the black hole’s mass from the dataset. They get a conservative upper limit of 40,000 times the mass of the Sun. For some perspective, a black hole this massive would actually only have a radius about twice the size of Jupiter. To reiterate, this work has highlighted how high resolution spectroscopy can resolve the atomic lines dominated the ‘noise’ in low-resolution spectra. This apparent ‘noise’ has been common among the ULXs stemming from X-ray binaries, suggesting a common origin for these radiant objects. You gus need a re-blog button. Your stuff is terrific and I could re-blog for you and reach you 800 readers you do not have. Thanks for the feedback, Richard and Bob! We went ahead and added a “WordPress Blog” option to the share buttons at the bottom of each post, which should allow you to reblog our posts on your WordPress-based sites. Let us know if you have any problems with it, and thanks for helping us share cool science! First, I am surprised to see you here. I always see you at AAS NOVA. I will try the re-blog button on the next post I see from astrobites. I got my start at Astrobites 5+ years ago — and though I retired from the active authorship, I’m still here behind the scenes. 🙂 Thanks again for the shares, Richard! Your site is a great one, and we’re always happy for extra exposure. Thanks a lot for sharing! We have done more work (and discoveries) which soon will be published! Hungry black holes devouring their companion stars till exhaustion !! !